Billy Corgan's avatar in Guitar Hero World Tour: he's not even playing a guitar! The Smashing Pumpkins are delivering an exclusive single for the upcoming game, Guitar Hero World Tour, which is due for release this autumn. The track will be titled G.L.O.W. according to game publisher Activision. "This marks the first time a band has recorded a new song exclusively for the franchise which will be released afterwards, giving Guitar Hero fans exclusive access to Smashing Pumpkins music before anyone else," Activision said in a press statement. The song will be packaged as a three-song download pack, alongside vintage Pumpkins tracks 1979 and The Everlasting Gaze. 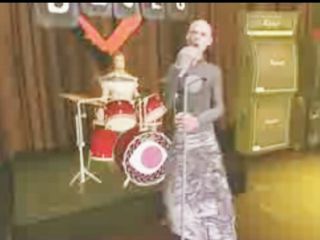 Additionally, Billy Corgan will appear as an in-game avatar - in a dress. "I feel totally ecstatic about it, because it gets people listening to music," says Corgan. "Guitar Hero right now represents music that people actually listen to." The assumption being that 'people' all play these video games, of course. The exclusive deal follows an earlier announcement by Guns N' Roses, who are to debut their track Shackler's Revenge as an exclusive track on the game Rock Band 2.